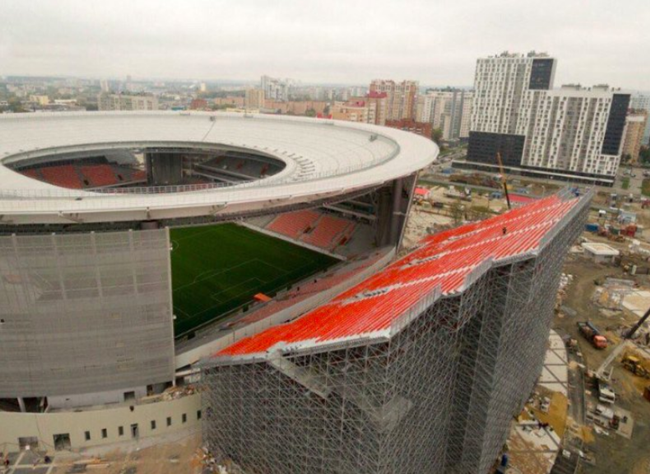 After being selected as a host venue for the 2018 World Cup in Russia, the suits at the Ekaterinburg Arena realised that they had their work cut out if they were going to boost the stadium’s capacity to meet the tournament minimum in time for kick-off. The arena in Yekaterinburg boasted an initial capacity of just 27,000 seats, some 8,000 seats shy of the FIFA tournament minimum which stands at 35,000. Yep. It looks exactly as insane as it does precarious. Like somebody’s taken a slice from a massive steel gateau. Thanks, but it’s a hard pass from Pies. That’s a far cry from English engineering. I predict 7 drunk Russians falling off of the new extension to vodka infused deaths. That’s why I come to this website.